Go to Setup -> My Domain (screenshot below). Select your domain name and verify it . If the selected domain is available to use, you can register your domain. To Register domain click on the “Register Domain” button. 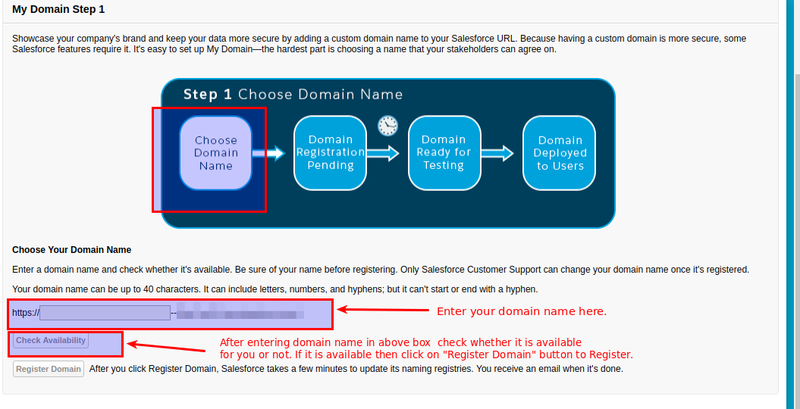 After you click “Register Domain” button, Salesforce takes a few minutes to update its naming registries. We will get an email when it’s done. After getting email, your domain is ready for testing. You will get an email from salesforce support account with below text. Step 4 : Deploy domain to users. This is the last step which should be their to run your lightning application. Now click preview button in your lightning application to view output. It will show the component output instead of the error message.